OCEAN BEACH, CA. 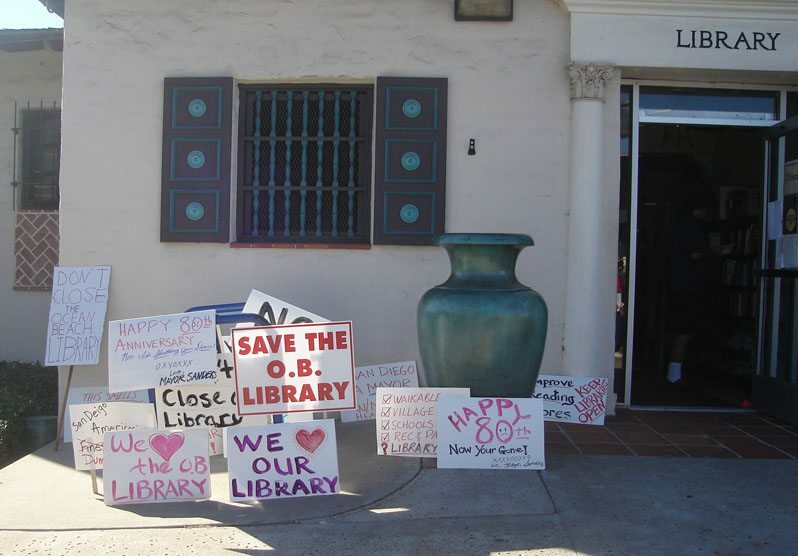 Over 600 Ocean Beach residents and supporters of the OB branch library have signed petitions demanding that the City not close the coastal community’s one branch due to Mayor Jerry Sanders’ budget cuts. Battle lines are being drawn – an Ocean Beach strategy meeting for efforts to keep the OB Library and other libraries open will be held tonight. The City Council meets Wednesday, November 19th, to continue its discussion on the Mayor’s proposed cuts – which include 7 libraries and 10 Recreation centers and gym. Plus rallies in support of the libraries will be held at each of the 7 libraries slated for closure next Saturday, November 22. OBcians are being urged to attend the strategy meeting, the Council hearing and next Saturday’s rally. Petitions are at the Library counter. According to James Lawson of Councilmember Kevin Faulconer’s office, public comment will be allowed during the Council hearing on Wednesday. There will be an update from both the Mayor and the Independent Budget Analyst, Lawson told me, then public comment, and if there’s time, then council comment. It is possible that the Council would vote on budget recommendations on the 19th. John Rivera, Councilmember Faulconer’s chief of staff, called me to assure that Mr. Faulconer stands committed not to vote for closing the OB Library and that he is working with his colleagues to find alternative funding. When the people lead the leaders follow! The IBA report reflects ALL the issues we raised. Now we must ask the council to support the preferred option: defer a decision until a comprehensive plan is brought forward to the city council. That says it all. And the report identified monies in the library facilities improvement plan to cover the gap (and remember that is only a temporary measure). Be prepared for enormous pressure from the mayor’s office! Time for rational decision making based upon community input and budget realities is the next step. More to come! In a former life I had a business fighting city hall for people in Orange County. I have found the best way to get a city council and mayor to change their already made up minds is to make it look very politically incorrect for them to Stay their course. In our case, I think that would be (1) all the elderly and “homeless” that utilize the library for shelter and connection with the rest of the world and (2) students that use the library’s resources to allow them to compete with more affluent communities. This is a brief report of the strategy meeting that was held tonight (Tues 11/18); there were people from the OB Historical Society, Friends of the OB Library, OB Town Council and the OB Rag blog, plus a whole bunch of ‘concerned OB citizens.’ A number of us will be making it to the City Council hearing tomorrow – Wed 11/19 – on the budget to of course oppose the closure of our library and all the other ones as well. A vote could very well take place sometime tomorrow afternoon. We’re encouraging anybody who can to join us downtown from 2 to 5pm on the 12th Floor of City Hall. There’s car-pooling from the OB Library at 1:15. It was announced that we’ve collected 1000 signatures on our petition against the closure of the OB Library. Also, there are rallies in front of all 7 branches slated for closure next Sat Nov. 22 at noon. We’re encouraging everyone out for that event which may be simply sign holding in order to keep the issue in front of our fellow neighbors and the Mayor. Also anyone interested in discussing strategy to meet us there at that time. THE U-T’S GLARING OMISSION Take a look at the letters to editors page in the U-T today Nov. 19. NOT ONE PUBLISHED LETTER ABOUT THE CITY BUDGETS CUTS the day after they ran front page articles on them. I sent off a letter yesterday morning and their mail box was so jammed up that it couldn’t be delivered for hours. Doesn’t it strike you all as “business as usual” that comments from the people aren’t published the day of the council hearing? Please send them a “we know what you’re up to letter and it stinks” at letters@uniontrib.com. The U-T did have a small blurb on the front page about today’s Council Hearing. I called U-T reporter Helen Gao yesterday to see why she didn’t mention OB in her recent article about the closures. She responded by saying she’s writing a long article for this Saturday’s issue.